When it comes to fashion, I’m pretty plain. My daily uniform is usually jeans and a t-shirt. When I speak, I gussy up the jeans and t-shirt with a sport coat. Throughout my entire life, my shoes have typically been one color (black or white) with no more than one accent color. To me, fashion is all about two things: comfort, and not looking like an idiot. Since I’ll never be mistaken as a New York City fashionista, the “looking like an idiot” part is avoided by keeping things plain and simple. And then I started thinking about getting red shoes. A few months ago, I found myself in the market for new sneakers. Every once in a while, I would notice someone wearing red shoes. I’m talking ALL red, not white or black with a tiny splash of red. They’re hard to miss, those Red Shoe People. I always thought to myself, “Man, I wish I could pull those off.” Those Red Shoe People always seemed so fun and confident and free. Eventually, the wish become stronger and the whispers became louder. People will notice you more. And not in a good way. Who do you think you are? A celebrity? The only people who can pull crazy stuff like that are celebrities. Face it, you’re just not one of those Red Shoe People. Eventually, these so-called reasons really started to get to me. I spent A LOT of time mulling it over in my head. It became clear that this was about more than shoes. Ultimately, I had only one person to convince — myself. I decided I didn’t want to be a damn fool. I wanted to be one of those people who wear red shoes. And so I ordered a pair of red New Balance shoes from Zappos. Knowing they had a generous return policy, I was going to get a more “conservative” pair, just in case I really couldn’t pull off the red shoes and needed to send them back. As it turned out, they didn’t have the fallback pair in my size, so I just ordered the red. I love them. They are probably my favorite pair of shoes I’ve ever worn in my whole entire life. I love how they make me feel. Not just because they make me feel fun and confident and free, although they do, in spades. They make me feel like a guy who decided it didn’t matter what other people think. And that’s where the fun and confidence and freedom come from. My soul smiles every time I tie the laces. Here’s the deal: You ARE that type of person if you WANT to be. Simple as that. Life’s too short to worry about what other people think. 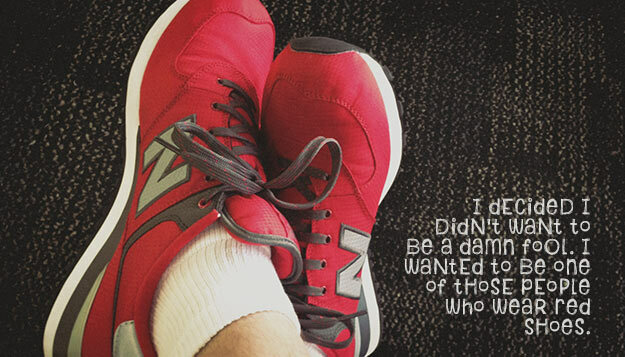 What are the “red shoes” in your life? choose from the fun side of my closet for ordinary days & occasions. I always match the color of my shoes with the color of my t-shirt! So I have many different colors (probably way too many). But I love it! Still need yellow shoes, that’s the only color I’m missing. I smiled right out loud when I read about your red shoes! My husband, Rich, has worn red converse tennis shoes since his high school days back in the 70’s. He is famous around these parts and the little ones (now adults) call him “Mr. Red Shoes.” Our family doctor, originally from the Phillipines, said every kid there wanted a pair & would buy them off the American Service guys just to have a pair of red converse shoes, back when he was growing up. For me, it’s cowboy boots. Had a pair when I was young & not since. My daughter loves them too. Finally this summer I purchased a new pair with the cool heels & fancy stitching. My only regret….I should have gotten red instead of the black. Maybe another pair is in my future. I’m glad you shared your story and you got the red shoes! Hey Jason, love the red shoes! A couple of things… First I am on a plane leaving New York, and let me tell you they are not all fashionistas!! Second what I find myself saying now is, am I too old to wear that. I’m bold enough but I don’t want to look like I’m trying too hard! Debbie, there are usually toned down (age appropriate?) versions of things. For instance, I wouldn’t think twice to see ANYone wear red Keds. I was 40 when my brow was pierced, so I understand the idea of trying too hard. In the end I decided my face was incomplete without it. The wardrobe I have is a lot of solid colors so if I step out & get something patterned or frilly it feels like a “red shoe” kind of thing. Yesterday I bought a multicolored summer purse that I was seriously thinking about taking back. Now I’m going to contemplate that some more to see if it’s fear that is making me want to do that. The biggest “red shoes” I have are my eyebrow piercing and fashionable hats. They have both taken a some courage, but I am always glad I have & wear them. I love my red shoes! Good for you…I like your red shoes, they’re snazzy! Your post reminds me of when I was in basketball camp back in 7th or 8th grade. I was always a shy, quiet kid when I was in grade school. I just did not want to bring too much attention to myself. But I always wanted a pair of Converse All-Stars. For basketball camp, I purchased my first pair…a pair of red ones. I really liked them…and gained some additional attention from the other camp attendees. Sadly, I did not become the next Larry Bird or even the next John Paxon by wearing those shoes…but I did have fun wearing them. And isn’t that what life is about? Anyone who does not have a pair of red shoes, really should get a pair. You just feel different – more fun, more daring, more alive. I do anyways :) We have a guy at work who wears red pants 365 days a year – not sure I’m ready to be that daring, but it does make you wonder how it changes his perspective on life. Love it! Read this out load to my husband. My “red shoes” is a chain crown (very hippy-ish) that makes me feel like a warrior princess. :) My husband “red shoes” is a tattoo he got on his arm two years ago. He always wanted a tattoo (and yes, now he wants more!) but he also always heard the voice in his head that said, “you are not a tattoo person”. Thanks so much for this post. It’s so much fun to step into life just being who we are…and it takes courage to fight back the “no-fun” and fear-filled voices that try to limit us from being ourselves but its always worth it. And when we give ourselves permission to be more free and full of grace, we give other people permission too! Thanks for paving the way. oops..out loud not out load ;) Sorry. Typing fast on our way out the door to church! Scarves! I thought people would think I was too full of myself, trying too hard to be “pretty” and draw attention to myself. Now I have a dozen scarves and I love them! EXACTLY! I had the same revelation, and about shoes, in March. My ideal shoes have always been “safe.” But for several months, I had been looking at a pair of shoes at RoadRunnerSports.com. Asics Gel Kinseis, in the color “multi.” Multi doesn’t even begin to describe them. Each panel of each shoes is a different neon color, and the shoes don’t match. Even the soles are different – one neon pink, the other neon green. When I first saw them, I thought, “How hideous!” But I kept thinking about them. I was spared having to make a decision for 6 months, because they weren’t available in my size (women’s 11 1/2 – most shoes aren’t). However, In March, I took another look, just to enjoy how they look, and (drumroll, please) they were available in my size. It was a sign. I bought them. I didn’t care what anyone else thoguht of them, but you know what? EVERYONE LOVES THEM. Perfect strangers stop me to ask about them. A couple of people have taken pictures of my feet. They make people smile! They make ME smile! Now I have a pair of solid neon pink running shoes, too, and I’m NOT a pink person. Buit the shoes are bright and cheerful,and THEY MAKE ME SMILE. I wish I could say I had a “red shoes” moment but I’m still a work in progress. My son, on the other hand, is no shrinking violet when it comes to color. He sported a Bazooka Joe, bubble gum pink tux on his 6’5″ frame at prom and rocked it. What started out as a planned prank among a group of guys fed up with the prom drama turned out to be a huge confidence builder for my son when the others backed out and went traditional/conservative. He stuck with the plan, with some interesting results. Instant smiles. Laughter. Complete strangers came up and told him they thought he looked great or congratulated him on his nerve. A few even asked him to pose for pics with them. May he remember that day and keep that confidence forever! I recently bought a pair of red wedges that have a woven pattern of other colors. I rarely wear what I would call “fun” stuff, usually my wardrobe is fairly conservative. I’ve received several compliments on the shoes and they make me feel special. It’s weird how seemingly minor things can have a big impact on us. Recently we went shopping for a new automobile. I, like you, don’t like to draw attention to myself. My husband wanted to purchase a red vehicle and I just did not want red. After a few hours of cussing and discussing the fact that the best buy on the lot was a red one I gave in. It’s been nearly a week and it is quickly growing on me. Maybe I will get myself some red shoes to go with my new Ford Edge! 3 Pairs and when one wears out I get another!